This is No 3 of a series of 4 pretty small castles. Each does have it’s own small Mandala Garden plus some extra ornaments and decorative frames. You can stitch them single, on a band sampler style linen banding – or all together on one larger piece of linen. Cross stitches are combined with Special Stitches – you will use silks and variegated threads, metallic braids, beads and crystals to create a piece of embroidery with different textures and dimensions. You will recieve this design in 3 parts just as it was published as online class back then. 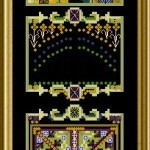 The mere design stitch count is 44 x 176 stitches.